“Back to London for Lot 220, Land adjoining Furze Lodge, Plumstead SE18″, the auctioneer said, “Lot of interest, someone on the phone, couple on the internet. Shall we start at £30,000?” The bidding quickly progressed to £60,000 in £5,000 steps when it was sold to a phone bidder. I was watching the final stages of Allsop’s residential auction over the internet at home. I had dropped in for a while to the real thing at the Cumberland Hotel, in a large basement meeting room smelling of toast and hotel breakfasts, picking up a thick, glossy brochure and sheaf of addenda on the way in. There were probably a couple of hundred people there, sitting on a dozen long rows of chairs, loitering at the back and huddled against a wall that had been declared a TV-free zone for those who didn’t want to accidentally appear on a TV show that was being made about the auction. On the opposite side a raised dais hosted a set of be-suited phone bid takers. At the front alongside the auctioneer was a powerpoint slide showing the current property being bid for with the latest price. The auction was surprisingly slow; many times a new bid was announced seconds before the gavel descended for the third and final time taking the auction off again in decreasing increments. Unfortunately I couldn’t wait for lot 220, which was just as well as they didn’t get to it until some 7 hours later. The property is situated on the west side of Plum Lane close to Dallin Road, opposite Shrewsbury Park with views across London. Local amenities are available nearby, with the more extensive facilities of Woolwich town centre being within 1 mile to the north. Docklands Light Railway (London City Airport 10 minutes) and Overground services run from Woolwich Arsenal Rail Station. Road access is afforded by the A207 (Shooters Hill) and A205 (Academy Road). The open spaces of Shrewsbury Park and Shooters Hill Golf Club are close by. The property comprises a broadly rectangular shaped site which extends to approximately 0.016 hectares (0.040 acres). The site has frontage to Plum Lane. Local Planning Authority: London Borough of Greenwich. The property may afford possible development potential subject to obtaining all necessary consents. The area of the plot, 0.016 hectares, is equivalent to a square of side 12.7 metres, so why would someone pay £60,000 for it? I can only assume that it’s because of that magic phrase “possible development potential”. Any development would, of course, require planning permission, and at the moment it seems unlikely that permission would be granted. The people who carried out the conversion of the former gas decontamination centre that expanded Furze Lodge applied for permission to build a tiny “two and half storey two-bed dwelling house” on this plot. 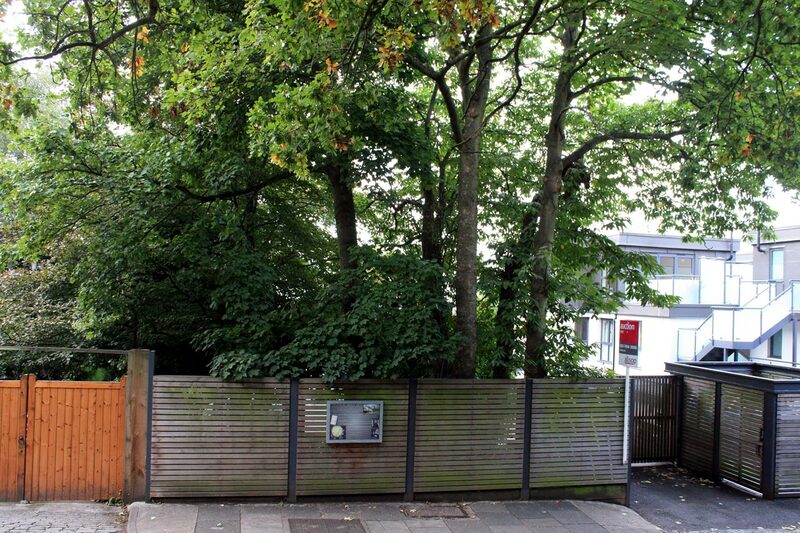 Amongst the 8 reasons the Royal Borough planners gave for rejecting the application were that the proposed property would “be built on land previously set aside for the use of the flats at Furze Lodge as a communal garden space”, which was approved under the original Furze Lodge application. They also mentioned the adverse impact of the house on homes in Brinklow Crescent and the problem of overlooking neighbouring properties in Dallin Road and the new Furze Lodge flats, and that the density of the development was too high. London’s housing shortage is the root cause of developers’ willingness to pay high prices for tiny plots of garden land like this. There are a number of other cut-off scraps of gardens in the area, particularly along Mayplace Lane, where multiple applications to build tiny houses have been rejected by the planners, following which the land has been neglected and in some cases has become an eyesore. I get the impression that the owners are waiting for political change or the pressure of increased demand before submitting yet another application to build, leading to uncertainty for neighbours who value their environment. At a time when tens of thousands of new homes are being built across Greenwich do we really need to squash little boxes into every gap on the hillside? I would like to echo your observations on the auctioned scrap of land, and also the ‘developer creep’ that goes on wherever it looks like a lucrative investment – never an opportunity for people in the area in need of housing. I suppose all we can do is be alert to planning consultations and Council meetings and trends – and act on them. The Furze Lodge developers could have been more creative and sympathetic to the neighbourhood and their buyers instead of selling it off for quick cash.